I didn’t set out with a summer goal to jar 17 quarts and 8 pints of cucumber pickles. It came about when our friends were out visiting last week. They are smack in the middle of the most fun summer of record, beginning with riding their brand new touring bicycles to our house, and then regaling us with stories about their sailing trip in the San Juan Islands, Shakespeare in the park in Vancouver, concerts at wineries, and on it went. We recounted our own stories about painting our living room. No. Don’t feel sorry for us; we are living the life we choose. But while they were here, they got the phone call that their custom-ordered box of perfect pickling cucumbers was ready to be delivered. Now, they have never canned before and only had a passing interest in making pickles this summer. In fact, I think they had forgotten all about it. They were about to go to town and plop down a hefty investment in canning supplies when I made an alternative proposal. 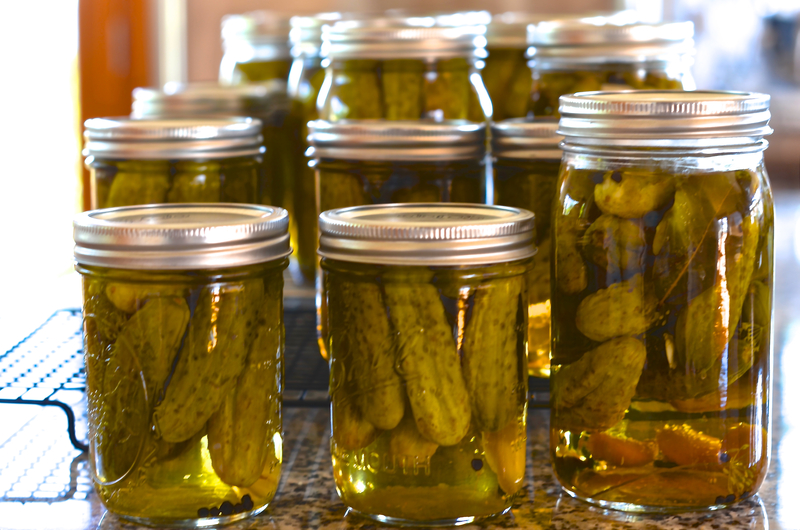 I suggested that I take the cucumbers and use my plentiful canning supplies, and the assistance of Gabe, an experienced pickler, to make the pickles, and they continue with their mad summer. And that was quickly agreed to. So, what was delivered was a lot of cucumbers and I had to do much multiplication to prepare enough pickling brine, but I still got the salt wrong and had to make four gallons of liquid instead of two. Fortunately, we brew beer and have a 6 gallon stock pot. In the end, I had extra brine left over, and I stored it away in the refrigerator. Now, the brilliant thing about this is that I am ready, in a moment, to pickle anything. 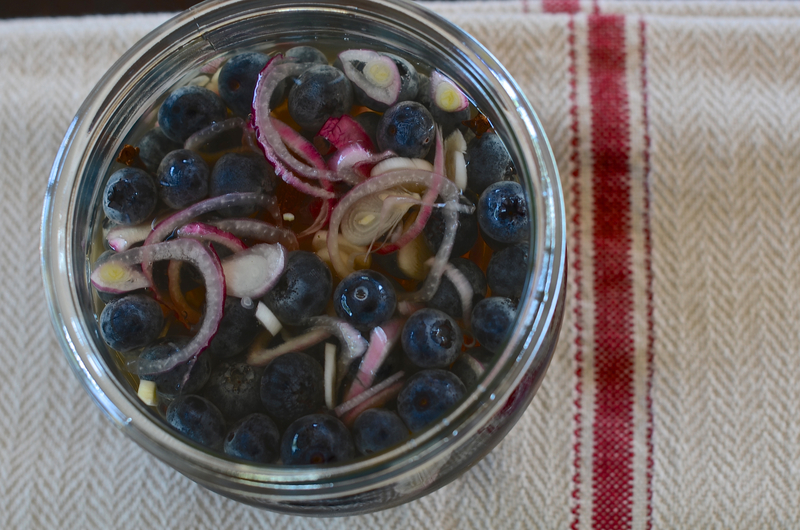 Quick pickling only requires an hour or so in brine so the commitment is small and involves no true preserving. I began today with 1 1/2 cups of organic blueberries, a large shallot, thinly sliced, 1 small cinnamon stick, and 5 whole cloves. These are going on top of a grilled steak salad for dinner. If you’re interested in what else you could quickly pickle, take a look at this link from Saveur magazine: Perfect Pickle Recipes. Here is the basic cucumber pickle recipe I used, also from Saveur. Just save the brine from the salt, sugar, and vinegar for other uses. Also, I recommend you buy a smaller box of cucumbers. 1. Dissolve 1/4 cup salt in 2 1/2 quarts water in a large bowl. Add cucumbers and set aside for 12 hours. Drain and rinse. 2. Combine 1/4 cup salt, sugar, vinegar, and 2 cups water in a saucepan. Bring to a boil over high heat. Add peppercorns, garlic, and bay leaf and boil for 2 minutes. Fit cucumbers upright in 2 hot, sterilized quart jars. Tuck in dill. Pour hot vinegar mixture over cucumbers to cover. Add leaves, if using. Put lids on jars, screw on bands, and process in a boiling water bath for 15 minutes. Remove jars from pot and cool. Store in a cool, dark place for at least 3 weeks and up to 1 year.